Mishka is from a litter that we planned and waited eagerly for. 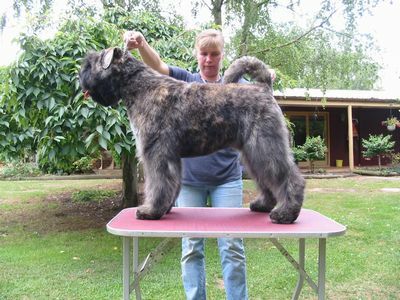 He is out of Ch Estrik Steffi and sired by the newest Vanenblikhoeve import Tosh-Dusty (owned by Judy and Paul Merrett). He is a gorgeous pup both in structure and temperament and he is very much loved by all his family. He has had a very limited show career to date ( 3 to be exact). For both Mishka and his owners the show scene has been a very steep learning curve!! As he matures and his owners get more confident he will go ahead in leaps and bounds.